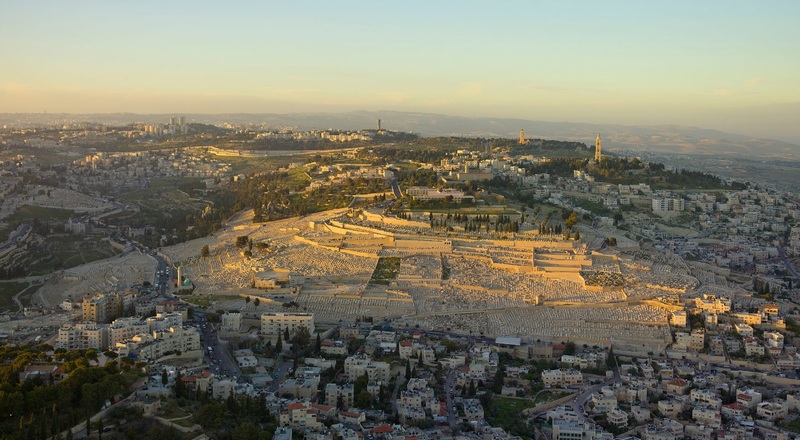 Just a short walk east of Jerusalem's Old City and the Temple Mount lies the Mount of Olives, a large hill that rises to about 2,700 feet above sea level. It's the middle of the three peaks directly across the Kidron Valley, with Mount Scopus to the north and the Mount of Corruption to the south. The mountain's slopes were once covered in olive groves, which is where it gets its namesake, but few olive trees remain. In their place are roughly 150,000 Jewish graves. The graves are so tightly placed together it may be one of the most densely packed cemeteries on earth. Along with Mount Zion and Mount Moriah, it is one of the three most historically and prophetically significant mountains in the Bible. It was from this mountain that Christ ascended into Heaven, 40 days after His resurrection, and it's to this same mountain that Christ will physically return at the end of the Great Tribulation (Acts 1:6–12). In 1 Corinthians 15:5–8 the Apostle Paul gives a summary outline of the order of Christ's post-resurrection appearances. After first appearing to Mary Magdalene (Jn. 20:11–16), Paul tells us Christ appeared to Peter and then to the Apostles (1 Cor. 15:5). After that, over 500 disciples gathered for one appearance (1 Cor. 15:6), likely when Christ delivered the Great Commission on an unspecified mountain in Galilee (Mt. 28:16–20). He then appeared to James and again to all the Apostles (1 Cor. 15:7). This was the last appearance Paul records before mentioning his own experience on the road to Damascus, thus it was likely this smaller gathering of Apostles at Christ's ascension. I can only imagine the weight of fear and uncertainty that the eleven remaining Apostles must have felt as their LORD was now physically leaving them. As they huddled together atop the glorified hill, just east of the city where dozens of Jewish leaders wanted their heads on a platter, doubts plagued the hearts of men not yet filled with the Holy Spirit. In the resurrection accounts in the gospels and Acts, we see men who needed constant direction and encouragement before Pentecost. Thomas wanted evidence (Jn. 20:24–29) and other disciples were simply dumbfounded by the empty tomb, still not understanding Jesus' frequent foretelling that He would rise again (Jn. 20:9). They were looking intently up into the sky as he was going, when suddenly two men dressed in white stood beside them. 'Men of Galilee,' they said, 'why do you stand here looking into the sky? This same Jesus, who has been taken from you into heaven, will come back in the same way you have seen him go into heaven.' Then the apostles returned to Jerusalem from the hill called the Mount of Olives, a Sabbath day’s walk from the city. Then the Lord will go out and fight against those nations, as he fights on a day of battle. On that day his feet will stand on the Mount of Olives, east of Jerusalem, and the Mount of Olives will be split in two from east to west, forming a great valley, with half of the mountain moving north and half moving south. You will flee by my mountain valley, for it will extend to Azel. You will flee as you fled from the earthquake in the days of Uzziah king of Judah. Then the Lord my God will come, and all the holy ones with him. The Mount of Olives is thus the penultimate symbol of Christ's second coming because it's from this mountain He went into Heaven and it's to this very mountain He will return. And now you know why the present-day mountain is covered with graves and sarcophagi: The Jews know that their Messiah is returning to this very mountain per the Prophet Zechariah and thus many have anticipated being resurrected first when He comes. Tragically, many failed to realize that their Messiah has already come a first time and His message they did not hear. The last shall be first, and the first last. A primarily Gentile resurrection will occur first, because Israel largely rejected Christ at His first appearance, and the major Jewish resurrection will occur last, at Christ's second coming. This eschatological switcheroo is actually what begins the final salvation of unrepentant Israel. When they see many of those foolish Gentiles gone, and the words of the prophets fulfilled, a great jealousy will overtake them and they'll want the free gift the Gentiles were given. With a good understanding of the prophetic importance of the Mount of Olives in place, we can begin to decipher the plain meaning of Jesus' own prophetic predictions concerning the end of the age and His return. Jesus' prophecies in the gospels are important to understand, and many, giving superficial explanations, have caused great confusion. These prophecies, often commingled together by textual critics as the Olivet Discourse, are actually separate discourses, precipitated by separate questions. They are thematically related, and for that reason, those with little concern for detail wrap them all up together. Failing to notice the key details is what leads to square-peg-round-hole interpretations like preterism or post-trib premillennialism. I'm primarily focused on Matthew 24 and Luke 21, but I'll also touch on Mark 13 and Luke 17 (Matthew and Mark have almost the same account with only slight differences and Luke 17 is a different conversation altogether). V. 1 - Jesus is leaving the Temple and His disciples approach Him as He's leaving. They gawk at the magnificence of the Temple's architecture. Mark 13 adds some key details. One disciple remarks "Look, Teacher! What massive stones! What magnificent buildings!" (Mk. 13:1). V. 2 - Jesus tells them all that beautiful architecture is going to be destroyed. The Temple will fall and not one stone will be left standing. All three synoptic gospels record the same (c.f. Mk. 13:1–2; Lk. 21:5–6). 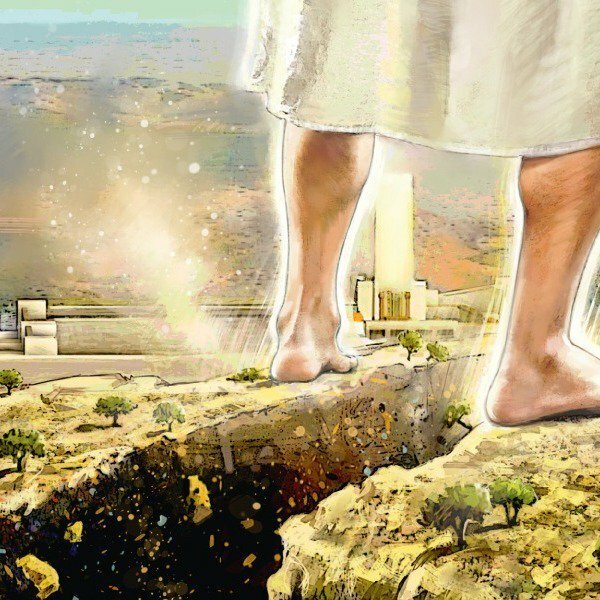 V. 3 - Jesus is now sitting on the Mount of Olives, no longer walking away from the Temple. His disciples ask a very specific question: "Tell us, when will these things be, and what will be the sign of your coming and of the end of the age?" The question asked is specifically about Jesus' second coming and the actual end of the age. So what are "these things"? A reader might naturally think the destruction of the Temple because of the preceding two verses, but that doesn't take into account two much stronger points: 1. This is a different conversation in a different location, and 2. The specific question the disciples ask concerns the second coming. No doubt, at the time, they saw little difference between the Temple's destruction and Christ's return, but as history and further New Testament revelation have shown us, they are accompanied by a similar series of signs, but are not the same event. The Gospel of Mark confirms the Matthew account's chronology and scene change. Again, like the first two verses of Matthew 24, the first two verses of Mark 13 concern the conversation Jesus had with His disciples as He was leaving the Temple and v. 3-on is a record of Christ's actual Olivet Discourse (just like the Matthew account). VV. 3–14 - Jesus tells His Jewish disciples what signs will precede His return. He's answering their question directly and without confusion, not being facetious or alluding to something else entirely (i.e. the Temple's 70 AD destruction) as many textual critics would suggest. And what's most amazing, these twelve verses chronologically parallel the first five seals of Revelation, which occur after the Church is raptured to Heaven. V. 8 adds a key detail: "All these are but the beginning of the birth pains." When do the prophetic "birth pains" occur? During the Time of Jacob's Trouble (Jer. 30:6–7), after Heavenly Zion has already given birth to the corporate male child, the Church (Isa. 66:7–9; c.f. Isa. 26:17–21; 1 Thess. 5:3–4). VV. 15–20 - Jesus describes mid-trib events, including the final Abomination of Desolation spoken of by Daniel, and the remnant of Israel's escape into the mountains. Read these verses carefully and hold onto them because we'll discuss them in more detail when we work through Luke 21. VV. 21–22 - "For then will be great tribulation..." Here Jesus makes it emphatically clear that after the Abomination of Desolation there will begin a period of time more terrible than any other period in history: "...such as has not been from the beginning of the world until now, no, and never will be." That necessarily means worse than the Global Flood. The only period of time worse than the Flood is the upcoming Great Tribulation. I've seen preterists attempt all sorts of fancy linguistic gymnastics around these verses, but the plain, literal sense of the Scriptures are clear. V. 22 drives the point home even further: not one human being will survive this period of time if God doesn't directly and miraculously intervene. This is not 70 AD. VV. 23–28 - Jesus compares and contrasts His second coming—which will be public and visible across the whole sky—with the "comings" of the false prophets and christs that will most certainly arise to deceive many. Don't believe them. Jesus' return will be so glorious and powerful that there won't be even a hint of doubt that His coming is the genuine article. Make careful note of v. 28: "Wherever the corpse is, there the vultures will gather." VV. 29–20 - After the Tribulation, Christ returns from Heaven. Note that His coming is accompanied by a darkened sun and a darkened moon, not a darkened sun and blood moon. This is neither the Joel 2 prophecy nor the sixth seal. Note also that Jesus calls the preceding time "the tribulation of those days," thus there is some textual warrant for calling the broader period of Daniel's 70th Week "the Tribulation." V. 31 - Jesus gathers the elect—presumably the remnant of Israel and any surviving Gentile believers. Notice that no resurrection is mentioned and this is not a gathering to meet the LORD in the air. This is not the rapture. This verse may possibly include the resurrection of the Tribulation Saints/5th Seal Martyrs per Revelation 20:4, but that would only be an argument from silence. Taking Revelation 19–20 chronologically, the resurrection of the 5th Seal Martyrs likely occurs some number of days, weeks, or months later. VV. 32–35 - Jesus delivers The Parable of the Fig Tree. "This generation shall not pass away until all these things take place." Which generation? Obviously the one He had just been speaking about for the entire Olivet Discourse. And "all" implies the entire Tribulation and Christ's return, because that's what Jesus had plainly told His disciples. So depending on how long you determine a generation to be (Ps. 90:10 is the only direct biblical definition I'm aware of) and from which point you think that generation should begin, you could place a biblically-mandated upper limit on the return of Christ. V. 36 - "But concerning that day and hour no one knows..." Most literally, this was a perfect, not future tense statement of reality. Jesus tells us that no one up to that point has known the day or hour and the day and hour He is speaking of is most likely His second coming, which was the topic at hand. VV. 37–44 - Jesus' coming is likened to the days of Noah. He is coming at an hour you do not necessarily expect. He is coming like a thief. Some will be taken and some left. Now I know that a growing number of pre-trib scholars take this as a warning about Christ's actual second advent, but I would remind you this used to be a chief pre-trib proof-text. Just as the "Day of the LORD" refers to a broader period of time in Scripture, I think the "coming" spoken of in v. 37 is also referring to a broader period of time. This is His two-stage second coming, interspersed with Daniel's 70th Week. Jesus is giving a direct admonishment to His disciples: "You must be ready..." It takes some major heavy-lifting to justify the normalcy portrayed in these verses with the condition on earth at the end of the Great Tribulation. By the end of the Trib, all of the world's fresh water supply will be blood, most vegetation will be incinerated, most of the population will have the Mark of the Beast, most will be covered from head to toe in boils, many will have gnawed their tongues off because of the plague of darkness, and the antichrist and his enslaved population will be going to make war on the Lamb. I would argue no one will be grinding grain or sleeping blissfully unaware in bed. Jesus is warning us that the general period of His coming, known as the Tribulation or Daniel's 70th Week, will begin suddenly and unexpectedly. VV. 45–51 - Jesus tells a parable of a wicked servant who thinks his master's coming is delayed. The servant begins to do wickedly, scoffing in his heart. It's to this servant that the master comes like a thief "on a day when he does not expect him and at an hour he does not know." Compare Jesus' parable to 1 Thessalonians 5:3–4 in which the wicked are caught unaware when destruction comes suddenly like a thief. They do not escape, but the righteous are not caught unaware and therefore do escape. VV. 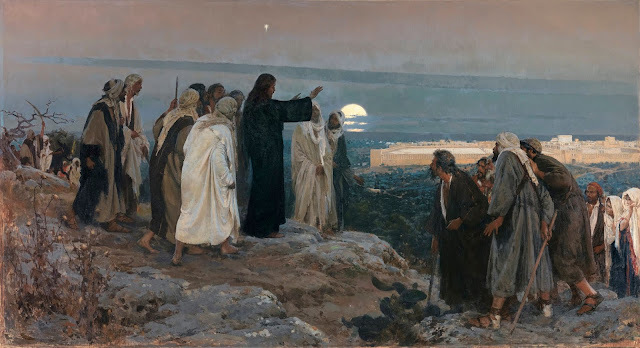 37–38 - For some unspecified period of time Jesus was teaching in the Temple from early in the morning until the evening when He returned to the Mount of Olives. For a number of nights He actually slept on the hill itself. So it was there on the Mount of Olives, at night, that Jesus' disciples came to Him privately asking about the end of the age and His second coming. But it was during the day that Christ foretold of the Temple's destruction as He and His disciples left the Temple. This is an important detail that further confirms the scene change in the Matthew and Mark accounts. VV. 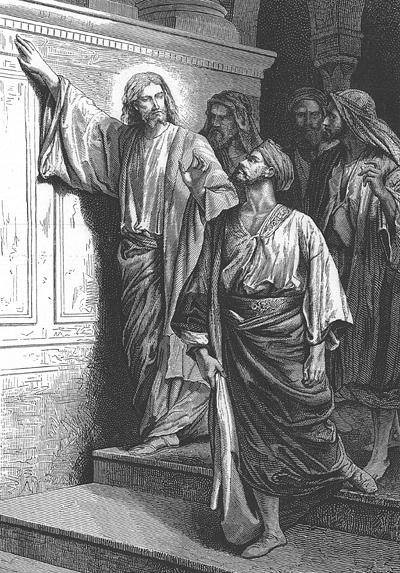 1–4 - While in the Temple, during the day, Jesus observes a poor widow who has given more out of her poverty than the rich out of their wealth. VV. 5–6 - Just like in Matthew 24:1–2 and Mark 13:1–2, the disciples marvel at the Temple's beauty and Jesus foretells of its destruction. Again, this is not on the Mount of Olives and isn't part of the Olivet Discourse. V. 7 - The disciples ask a different question than is recorded in Matthew. Instead of asking about the end of the age and Christ's return as they do on the Mount of Olives, they say, "when will these things happen? And what will be the sign that they are about to take place?" I would argue the question pertains to Jesus' prophecy of the Temple's destruction. Thus Luke is recording a conversation not found in Matthew or Mark. There are some similarities, but there are also vastly different details found in Luke. More on this in a minute. VV. 8–19 - Jesus describes a series of signs very similar, but not exactly identical, to the Matthew and Mark accounts. Indeed history has shown that false christs did arise in the lead up to 70 AD and Christians were greatly persecuted. There were also wars and rumors of wars. The nature of prophecy is cyclical—70 AD being a small foreshadowing of the much more literal fulfillments which come later. The Abomination of Desolation isn't mentioned at all. Jesus says that Jerusalem will be surrounded by armies. This detail is unique to Luke. The unequaled time in human history mentioned by Matthew and Mark is not mentioned by Luke. It isn't wrath against the whole world, but wrath against "this people" (i.e. the Jews). V. 24 - We know that Luke recognizes the scene change between the Temple conversation and the Olivet Discourse because of vv. 37–38, but in his record he doesn't explicitly tell us where this occurs in Chapter 21. However, he drops a big hint in v. 24 and this hint happens to give us (present-day you and me) a powerful indication that we are very close to Jesus' return. "They will fall by the sword and will be taken as prisoners to all the nations. Jerusalem will be trampled on by the Gentiles until the times of the Gentiles are fulfilled." Now keep in mind that Jesus is speaking to His disciples here, answering their question about the Temple's destruction. In the immediately preceding verse He had told them that "this people" (i.e. the Jews) would experience great wrath and then in v. 24 Jesus opens with "they." "They" referring to the Jews. The Jews were going to fall by the sword and be dispersed, not into just Assyria or Babylon as in centuries past, but into "all the nations." Jerusalem and its Temple were destroyed in 70 AD and the Jews were dispersed just as the prophecy foretold (although the dispersal took many decades). Jerusalem was indeed surrounded by armies—the armies of Titus, which sacked the city. These Gentile armies trampled on the city and its Temple, but not one believer was killed because Jesus had warned them. They all escaped. Yet over one million Jews were slaughtered. The pagan Dome of the Rock still stands on the Temple Mount and tens of thousands of Gentiles still live in Jerusalem, so we can conclude that the city is still being "trampled," but that trampling is obviously nearing its very end. Actual control of the city has fallen back into Israel's hands and more Jews dwell in their ancient capital now than at any time in the past. V. 25 - It is here that I believe Luke begins to record the Olivet Discourse and signs specifically pertaining to His second coming. In v. 25 we learn of "signs in the sun, moon, and stars." There is only one astronomical sign in the entire Bible that involves the sun, moon, and stars together and it's recorded in Revelation 12:1–2. That sign appears to have been fulfilled last September. "...Nations will be in anguish..." The focus has turned from Israel only (in the preceding several verses) to nations plural. We're now dealing with worldwide tribulation. V. 26 - "People will faint from terror, apprehensive of what is coming on the world, for the heavenly bodies will be shaken." Many things are coming on the world during the Tribulation: fallen angels, hail mingled with blood, meteors, 100-pound hailstones, and, ultimately, Jesus Christ and His holy ones. V. 27 - Jesus foretells of His actual glorious second coming. V. 28 - "When these things begin to take place, stand up and lift up your heads, because your redemption is drawing near." The specific end of the age signs that Luke records begin in v. 25 with "signs in the sun, moon, and stars." The Body of Christ witnessed this last year. If that was the beginning of "these things," how much closer are we to our redemption and glorification? I believe this verse parallels Matthew 24:36–44 and the admonishment to believers to be awake and watching for the rapture. However, I also think this will have dual application, being a warning to the surviving Tribulation Saints to hold on as they count down the days to Christ's coming. VV. 29–33 - Jesus delivers The Parable of the Fig Tree as recorded in both Matthew and Mark. Thus, the generation spoken of in all three synoptic gospels is the same: it's the generation that witnessed the sprouting forth of the fig tree's leaves and it's the generation that will witness Christ's return. VV. 34–35 - The Day of the LORD will come upon unbelievers as a trap and they will not escape. This period of time is coming upon all of those who live upon the face of the earth, thus there is no possible way to reconcile these verses, prima facie, with 70 AD. V. 36 - To the believer, Jesus tells you: WATCH! Believers will "escape all that is about to happen [and] stand before the Son of Man." To whom else could Jesus say they will escape all of the Tribulation events, but the Church? Notice that vv. 34–36 are a perfect parallel to 1 Thessalonians 5:3–4 and Revelation 3:10. In Luke 17 Jesus shares some of the same details found in the Olivet Discourse passages, but He doesn't discuss the Temple's destruction at all. The topic at hand is His return only. I won't break this passage down verse by verse since it isn't part of the Olivet Discourse, but will just give some summary information followed by an interesting pre-trib rapture hint contained herein. The first point to be made is this: the passage occurs four chapters before Luke's account of the Olivet Discourse and Jesus isn't on the Mount of Olives, He is near the border between Galilee and Samaria sometime before He arrived in Jerusalem (Lk. 17:11). And the second, equally important point: modern textual critics find similarities between passages and automatically assume the differences between the gospels are evidence of corruption, discrepancy, and the existence of an even older source document. Much can be said about the faulty assumptions they make, but I'm reminded that their way of thinking isn't in line with reality. What I mean is this: in the real world, people will talk about a subject they're passionate about many times. Thinking of myself, I can't tell you how many dozens of people to whom I explained the Revelation 12 Sign. Eventually my explanation crystallized and was basically the same spiel to every person with only modest discrepancies in how I delivered the message each time I delivered it. Likewise, consider how you might have shared the gospel with different people. I imagine the outline was the same each time you shared it, but some of the details and words you used may have differed each time you spoke. Jesus was no different. He taught publicly (and privately to His disciples) for several years. Imagine how many thousands of conversations He had with people during that period of time. No doubt He covered the same material many times. That's why we have similar accounts between Luke 17 and Matthew 24. The Olivet Discourse wasn't the only time Jesus discussed His second coming. The context leads me to believe Jesus spoke the words in Luke 17 somewhere near the border of Samaria and Galilee as He journeyed to Jerusalem (Lk. 17:11). But Luke 21 and Matthew 24 were records of Jesus' actual Olivet Discourse just outside Jerusalem. Moving on to an intriguing rapture hint, think back to Matthew 24:28 and what I had earlier said you should hold on to: "Wherever the corpse is, there the vultures will gather." Jesus says a similar phrase in Luke, but there is an important distinction: the word used for "body" is different and the context is different. Wherever the carcass [ptōma] is, there the vultures will gather. It's Jesus' visible second coming. After He slays the wicked during the Battle of Armageddon there will be an immense flock of birds that devour the flesh of the slain (Rev. 19:14–19). Wherever the body [sōma] is, there the eagles will gather. In Luke 17 the word for "body" is different. A ptōma, as found in Matthew 24:28, is only ever a dead body—a rotting corpse. But a sōma is just a body and usually a living body at that. It can also represent a collective body, like the Church (e.g. 1 Cor. 12:27). In both passages the word for eagles/vultures is the same: aetoi. The word probably means "eagles" in all instances, but some translators suspect it can also mean "vultures," depending on the context. I tell you, on that night two people will be in one bed; one will be taken and the other left. Two women will be grinding grain together; one will be taken and the other left. The context is very possibly the rapture. In Luke 17 the reference to eagles is in the context of the days of Noah and the sudden and unexpected appearance of Christ during a time of seeming normalcy. Yet in Matthew 24, which also includes a section on the days of Noah (vv. 36–44), the reference to eagles lies outside of the days of Noah warning, uses the Greek word for a dead body, and its context is Christ's actual second coming. Might Jesus have used different words for "body" in these two passages as a subtle hint? You're either going to be one who mounts up with wings like eagles as you meet the living body of the LORD Jesus Christ in the air, or, you're going to be a dead body on the plains of Megiddo when you try to wage war against the omnipotent Lamb. Choose wisely. While I think this outline is pretty solid on most points, I also think it's a good idea to continue to dig. There are several other entirely different ways to reconcile Matthew, Mark, and Luke's account and divide the Scriptures that I haven't addressed here. One of them includes considering how each of the authors decided to compose their gospel account, in some instances by combining different sayings of Christ to make a point. But when all is said and done, Matthew 24, Mark 13, and Luke 21 most certainly contain pieces from two different discourses—one near the Temple in Jerusalem during the day and the other on the Mount of Olives at night. The general topic at hand near the Temple was the Temple's destruction (and wouldn't that make perfect sense, Jesus discussing the Temple's destruction next to the Temple?). The topic on the Mount of Olives, the place to which Jesus will physically return, was, of course, His second coming. To the believers in Jesus' day He had a word of warning: When you see armies surrounding Jerusalem, flee! To believers in our day, Jesus has a word of encouragement: When you see these things begin to happen, look up for your redemption draws near. Watch! Concerning Luke 17 beginning and verse 20. Do you believe that is part of the Olivet discourse? Do you have any thoughts concerning that Passage? That's a great question. The funny thing is, as I was originally writing this article I had actually included Luke 17 in my outline. Some of the details are the same as the Olivet Discourse, but I believe they are two different teachings by Jesus. Luke 17 and Luke's record of the Olivet Discourse are four chapters apart and the context and setting seem different in Luke 17. There are also different details. There is an intriguing difference between the phrase "where the carcass is, there the vultures will gather" between Luke 17 and Matthew 24, which I think might actually be another pre-trib rapture hint. I may have to do an addendum. But here is an important point: modern textual critics find these similarities between passages and automatically assume the differences between the gospels and accounts are evidence of corruption and discrepancy. Much can be said about their faulty assumption, but I'm reminded that their way of thinking isn't in line with reality. What I mean is this: in the real world, people will talk about a subject they're passionate about many times. Thinking of myself, I can't tell you how many people I explained the Revelation 12 Sign to. Eventually my explanation crystallized and was basically the same spiel to each person with only modest discrepancies in how I delivered the message each time. Jesus was no different. He taught publicly (and privately to His disciples) for several years. Imagine how many tens of thousands of conversations He had with people during that period of time. No doubt He covered the same material many times. That's why we have similar accounts between Luke 17 and Matthew 24. The context leads me to believe Jesus spoke the words in Luke 17 somewhere near the border of Samaria and Galilee as He journeyed to Jerusalem (Lk. 17:11). But Luke 21 and Matthew 24 were records of Jesus' actual Olivet Discourse just outside Jerusalem. Thank you Gary for your really great work for the Lord always! Praying for you and all yours! Studying diligently your great articles! Blessings! You are most welcome, dear sister. Maranatha! 2 Thessalonians 2:3 is not talking about the rapture, it's talking about the day of the Lord as the Judgment poured out during the tribulation. Amos 5 refers to the day of the Lord as a very dark time where there is no light at all. This is one of the biggest mistakes that most people make, assuming that this verse, when it talks about the day of the Lord, is talking about the rapture. Read Amos 5 you'll see what I mean. When you apply what Amos 5 says about the day of the Lord to 1 Thessalonians 5 you find strong evidence when it says but you Brethren are not in darkness, you are children of the light and of the day not of the night nor the darkness. If we are the light of the world as Jesus describes Believers, and if we are not of the dark because if we are the light of the world and the day of the Lord is a time of Darkness with no light in it that means we are gone we are taken to Heaven before the day of the Lord starts. Now apply 2 Thessalonians 2:3, that day, the day of the Lord aKa the time of judgement, AKA the tribulation AKA Daniel's 70th week aka the time of Jacob's trouble, you get the picture, that day will not come unless the man of lawlessness is revealed. Later on in that chapter it goes on to say that the Lawless one will not be revealed until the restrainer is taken out of the way. The restrainer is the light of the world, the church indwelt by the Holy Spirit. So let's put it this way, the Antichrist or the man of lawlessness will only be revealed after the body of Christ, his church is taken out of the way and the day of the Lord, the tribulation cannot start until the man of lawlessness is revealed because what kicks off the tribulation is when the man of lawlessness or the Antichrist confirms or strengthens a covenant with many aka the Covenant of death with Israel and its neighbors and himself. 2 Thess. 2:3 is a hotly debated verse in Bible prophecy. If apostasia means "falling away" then pre-tribbers can still rest on v. 7 and the immediate context and differentiation of days. If apostasia means "departure" then the debate is over before it began. We discuss this a bit here and here. Came across this copy of an original 1560 Geneva online, that records Paul using the term ‘accept there come a departing first’ as opposed to the more modern interpretations ‘falling away/apostasy’? Holding to that context, within verses 6-8 does Paul not then resoundingly, further, confirm the Body of Christ as the restrainer and thus it’s ‘departing’ as the Harpazo ? Would so appreciate your discernment on this. Psalm 90:10 The days of our years are threescore years and ten (70); and if by reason of strength they be fourscore years (80), yet is their strength labour and -sorrow-; for it is -soon cut off-, and -we fly away-. Whose years? The author is Jewish... is he referring to their years? 'All these things are the beginnings of sorrows...' Sorrows is in this very passage... 'And unless those days be cut short, no flesh would survive.' The verse talks about it being soon 'cut off.' Finally, it ends with talk about flying away... Which has always been how the Rapture has been described, no? Everything in this passage seems to be pointed at by our Lord Jesus... So the only question left in my mind is... how much longer...? That's pretty interesting, isn't it?! Dear Kris (and Gary), read chapter 23 from the book of Jubilees, perhaps the Holy Spirit may open up some parallels to you about Psalm 90 and give you more understanding of the passage. Blessings to you! please forgive me for sort of changing the subject. The one thing that troubles me, that makes me think that Jesus may delay until about 2030, is because in 2030, or thereabouts, is 2,000 years since the birth of the church. Since Peter says a day is as a thousand years, and elsewhere it says, we will be raised up "on the third day", doesn't this make sense? Do you have a good article you can refer me to in regard to this subject? Believe me, I am so eager to believe Jesus is coming VERY soon (like this month), but this one thought plagues me. Can you help? Thanks very much. 1. Daniel and Revelation seem to use 360-day years when talking about long periods of time. In that case, 2,000 years have already transpired since Pentecost 33 AD (ending in Summer/Fall 2004). Interestingly, 2 x 7 years later brings us to 2018. 3 x 7 years later could potentially bring us to the end of the Trib or the middle of the Trib. 2. Remember that Jesus' prophecies about the fig tree indicate *all* things will be fulfilled in that final generation. We're quickly running out of time with that. If Psalm 90:10 is actually definitive regarding the length of a generation, than the rapture might need to be no latter than 2021. But suppose you're right and God intends to wait a full 2,000 solar years until the second coming (2033 AD). That means we're only 8 years away from the rapture MAX. That's nothing. That is certainly my hope and expectation. Thanks for the comments. This thing about 2033 hangs out there but it is not all encompassing to me. Like most people who read this site I can't help but believe His return is imminent, like September 11 imminent. And also reading Gary's articles, which seem to be so clear and strong hermeneutically, how can we not be so very excited? Maranatha! In that scenario, it would likely be even less than 8 years away for the rapture because of logistics. It is said by many that we're looking at the rapture taking place as many as three to three and a half years before the Tribulation starts. If this is the case, we could be looking at a 2021 or 2022 rapture as I know you have stated before in a previous comment. The below video series regarding this will be a help in understanding the rapture taking place as many as 3 and a half years before the tribulation. I highly recommend this video shared with me by a reader. His explanation of heavenly signs in 2018/2028 are pretty interesting and seem to line up with thing I've recently shared here and here (5th post from the top). Brilliant and illustrative, expanding on the things I'm finding in the sign to come from (Revelation 15:1). Thank you for sharing Gary!! Great video. So help me understand something. Assuming the video is an accurate interpretation of the signs, and the rapture occurs before the end of Oct, there is potentially a 3 year gap between the rapture and the beginning of the 7 year tribulation? Did I understand that right from the video? I find it interesting that 10/14/18 is 177 days from the hebrew calendar 70th anniversary, 153 days from the gregorian anniversary 70th anniversary, and 33 days from the torahcalendar.com day of Pentecost. It's also 386 days from 9/23/17 and G0386 means "resurrection." I have bumped into that number before while looking at the days between 8/21/17 and 9/11/18. Additionally, it's 3 days prior to Darren's watch date of 10/17. With all of the 3rd day references, maybe something is worth considering here. Sounds like those who were not inscribed from the beginning (Rapture) in the Book of Life will have 10 years (days) of trying to get right with Our Father before the Sheep and Goats judgment. Wow! I’d like to point out that in Matthew 24:37-44, it is translated not so well. The Greek word translated ‘left’ is ἀφίημι, meaning to send away, to permit, or to leave. The context seems to have to send away as a better translation, so this is actually translated as (taking into account proper verb tenses), ‘One is taken and the other sent away’. Thoughts? Strong's Definition: From G575 and ἵημι hiēmi (to send ; an intensive form of εἶμι eimi (to go)); to send forth, in various applications: - cry, forgive, forsake, lay aside, leave, let (alone, be, go, have), omit, put (send) away, remit, suffer, yield up. I have ALWAYS understood this as used for those "left behind" in the RAPTURE (compare also to Luke 17:34-36 same GLOBAL day-night situation and context described, same word used!). Hey another good article Gary. Thanks. I seen a video before, which sort of confirms about Matthew, Mark and Luke's version of the Olivet Discourse is being directed at different audiences. In Matthew 24:3 and Mark 13:3 the apostles came to Jesus "PRIVATELY"
In Luke 17 and 21 the word privately was not used. Could privately mean "Jewish Apostles" come to Jesus and ask Jesus to answer from the Jewish perspective. And could the lack of "privately" in Luke's account of the Olivet Discourse, indicate that this message was for the church! The video was called 100% proof Pe-Trib ......and soon! I do understand an expression like "privately" used when the disciples are ALONE WITH the master and not when teaching / discussing in public (when unbelievers or Pharisees around). God would speak differently to HIS people than to those that are not of his sheep (John 10!) and He would explain to them in private what was not understood in public (Mark 4:33-34 / Matthew 13:10-17). Thank you, I appreciate your perspective! I am cautiously optimistic that we are very well at the end of the age. I believe that harpazo is imminent. But, we still haven't been able to put all of the pieces together. Just when we think we have a true understanding of prophecy and/or end times events, something new is revealed in the Word. I hope we go home soon. However, there may still be a lot God still needs to do. I know that in my life, he is working on things that still have not come to pass but are being planned and set up to come to pass at a future date. He has made this very clear to me and that is why I'm not supremely confident that this is the year of the removal of the church. I guess we will have to just wait and see. But the Bible does say to occupy until His coming so that is what we are to do. Great article! Gary! That video. Wow! Your article answers a lot of questions for me so I thank you for your work. I watched another video just days ago on Prophecy Watchers that mentions the possibility of a gap between the rapture and the tribulation. First time I grasped the possibility. Gary, thank you for a fine article and tool to be foundational to further digging, Maranatha! A 7.8 to 8.1 earthquake just struck Fiji. Dan Matson predicted this YESTERDAY!!! I saw that! Wow! There also was a large on in Japan a day or so ago that sadly resulted in about 9 deaths. He used that 177 day repeating earthquake pattern, right? Thank you for the great outline and framework for further study! There's enough here to launch and keep small groups going for a while! :) More importantly, I hope it triggers a deeper personal study led by the Holy Spirit, on all sides, pre/mid/post tribbers, to know G-d's Word in a more detailed and intimate way than ever before. "The general topic at hand near the Temple was the Temple's destruction (and wouldn't that make perfect sense, Jesus discussing the Temple's destruction next to the Temple?). The topic on the Mount of Olives, the place to which Jesus will physically return, was, of course, His second coming." The darkness of the last Day will consume all mankind. Is it any wonder that the destroyer would see to it that even the light of the stars would be blotted out? That sun and moon would be hidden behind a curtain so dense that darkness *might* prevail? It may be that on the opening of that Day the only light burning on earth will be the fires stoked by Satan. Would even the darkness upon the deep be enough for the forces of Hell to be satisfied? The Earth, turning into a furnace seems a fitting time for the return of the Son of Man. (Reminds of G-d's image and creation being cast into the fiery furnace in Daniel 3). Indeed, what could be worse than the flood?! Earth, a burning ember snuffed out under foot. The work of the head of the serpent crushed under Jesus' feet. From the ashes of that furnace the last earthly Kingdom will rise. His wounded heel will restore heaven and earth. "VV. 29–20 - After the Tribulation, Christ returns from Heaven." "VV. 29–30 - After the Tribulation, Christ returns from Heaven." Thank you for your brilliant framework! I thought I would share my new points of study now that I think we have a good grasp of the substance of (Revelation 12:3). 1. (Revelation 12:1) "AND A GREAT SIGN WAS SEEN IN HEAVEN"
2. (Revelation 12:3) "AND WAS SEEN ANOTHER SIGN IN HEAVEN"
3. (Revelation 15:1) "AND I SAW ANOTHER SIGN IN HEAVEN GREAT AND MARVELOUS"
1. "Now a great sign appeared in heaven"
2. "And another sign appeared in heaven"
3. "Then I saw another sign in heaven, great and marvelous"
15.1 AND I SAW ANOTHER SIGN IN HEAVEN GREAT AND MARVELOUS, SEVEN ANGELS HAVING SEVEN PLAGUES, THE LAST ONES, BECAUSE IN THEM WAS COMPLETED THE WRATH OF GOD. This sign is interesting as I believe it may build upon the first sign (Revelation 12:1). "A GREAT SIGN" was marked by the sun, moon and stars while the next sign, a great red dragon, is devoid of these elements. We see different language for the dragon than that of the woman being the core elements. A language that is better suited for the AC and the beast. The last sign is more than "great", it is "marvelous" as well. That begs digging by itself! We all know what the fire of Acts represents. These are the same root words with slight variation to the use of "with" and "of" via the suffex if not mistaken. We all know that Luke was not speaking of actual flames of burning fire in Acts but of the Holy Spirit having the appearance "as of fire". Since the same word is used again in (Revelation 15:2), may it be that the sea of glass that is mingled with fire is a picture of the glorified (translated) Church age saints joined by the spirits of the martyrs from the tribulation before the throne of G-D? May we understand *fire* to be symbolic not only of the state of these people being in spirit but of the time from which they come? The Tribulation? And because they are set apart as being mingled but not part of the sea that they represent a different part of the body being born of a different time? One kingdom and body but in different states due to the timing. I have a lot more homework to do on this. A lot to ponder, pray and meditate about. But my findings thus far are exciting! Great thoughts, Pastor Rich. There is definitely something big with these heavenly signs. Hallelujah!, that Glassy Sea mingled w/ Fire*.... can't you feel our souls ignite in Glory! Thank you, Gary, for another wonderfully written article. It seems that Psalms 90:10 has become fairly popular as a possible marker for a generation, and your article and some of the comments got me thinking about 80yrs. I guess this struck my interest since Pharaoh viewed himself as a god. Therefore, we have a historic type of Jewish leaders standing before “god” when one was 80yrs old. I also saw one person suggest that Daniel was 80yrs old at the banquet given by Belshazzar written about in Daniel 5:1. From my research, it seems that most scholars agree that he was between 80-84yrs at this event. It certainly would be of prophetic interest if he was indeed 80yrs old at this banquet. Alright, I've gone back and added my thoughts on Luke 17 to the article even though it isn't part of the Olivet Discourse. This was wonderful. I went back to read the Olivet Discourse several times with your article in mind. I never noticed the change of location in moving from the temp to the mountain, but now that is clear to me. So here is my question. Is it possible that Jesus is referring to both what occurred, or was going to occur in 70 AD, and the end times at the same time when answering th disciples questions? Like a dual fulfillment? I think His conversation next to the Temple was only about 70 AD. The Olivet Discourse, however, was primarily about the Trib and Second Coming (after all, that was the question asked by the disciples), with possibly some allusion to 70 AD, as well. Has anyone thought that it (rapture) could possibly happen near Rosh Hashanah (feast of trumpets). Jesus fulfilled the first three feasts, Pentecost has been fulfilled, the next one is feast of trumpets. Any thoughts? Again, not setting dates, just theory. Oh, yes! FOT looks good. As does Shemini Atzeret. In fact, anytime between now and about 10/17 looks particularly promising, though we can only speculate. Gary , OMGoodness-gracious thanks for the video above. Everyone please watch !!!!!! As he stated in the video that may indicate there is a time lapse of several years after the Rapture - that definitely would explain a lot of trying to fit so much into a 7 year period. I concur with Gary, any time between now and mid-October hold promising signs. I tend to wonder if we may take a lesson from how the Sanhedrin used to calculate the timing of the Passover. "...it wasn’t enough for Passover to fall after the equinox, when it was 'officially' spring; spring-like conditions needed to be evidenced. If in the land of Israel the barley had not yet ripened, and the trees were not yet blossoming with seasonal fruit—that, too, was sufficient reason to delay Nissan by adding a second month of Adar [leap-year]. Spring should be felt; it should be bright and green. There were also several non-season-related factors which the Sanhedrin considered; for example, if the roads or bridges were in disrepair due to the winter rainy season, impeding the ability of the pilgrims to travel to Jerusalem for Passover." The signs and events leading up to Jonah's arrival in Nineveh were shocking having, war, disease and a solar eclipse. So much so that the king relented and decreed that ALL would humble themselves before the LORD. We know today that this only delayed their destruction, but as *ripe* as the days appeared for Nineveh, it was not yet their time. Perhaps the same is true for us? No matter what, G-d's time is G-d's time. I know that's hard when we're like children ripe with curiosity; waiting to open a wrapped present. What's in it?! What's is it?!! As much as some may think that this is what we're all about, it is not. Watchmen watch. Watchmen study. Watchmen pray. Watchmen remind us of the precious value of each day. Watchmen point attention back to G-D.
Humbly keeping watch is an act of obedience and an act of worship. That is why I have chosen to share in this place. That is the only sign we really need! Still...the kid in me wonders, "What's in it?!" i like this here study! and i like that word-Worship!!! From what I’ve read at weather.com, Florence could be a major hurricane (Category 3-4) by the time it reaches the East Coast (Wed. evening Sept. 12th or Thurs. morning Sept. 13th). This is interesting since this island has been connected to the missing colony from Roanoke Island. In fact, the only clue pointing to the whereabouts of the entire lost colony was a carving on a tree that said “CROATON” (Believed to be the modern-day Hatteras Island). Another interesting note is that this missing colony consisted of 115 men, women, and children. Thank you Gary. Much needed insight into these teachings. Well, at least according to the civil calendar it's a new year! Rosh Hashanah has been ushered in. i24news reports that "the global Jewish population stands at 14.7 million, the majority of whom live in Israel or the United States, according to figures published Sunday by the Jewish Agency for Israel. Israel is home to the world's largest Jewish population, with 6.6 million Jews (45 percent of global Jewry) living in Israel. Another 8.1 million Jews live outside Israel, including 5.7 million in the United States." "Another 23.5 million individuals, however, would qualify for Israeli citizenship under the country's 'law of return' which extends citizenship rights to every Jew, or child or grandchild of a Jew. 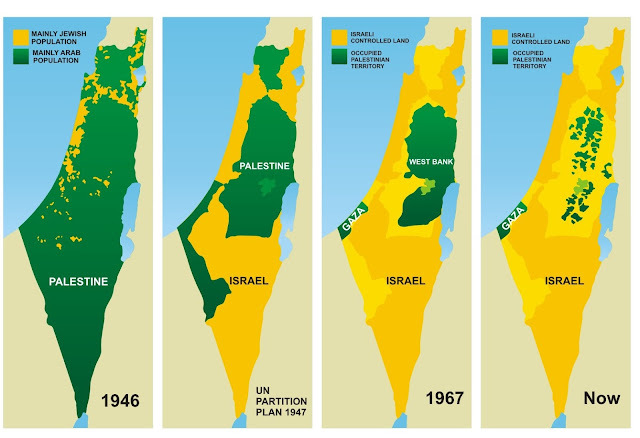 ...data predicts that the Israeli population is estimated to reach 10 million by 2024." I thought I would share those population figures as they are interesting. Was the moon seen yet? It's just past sunrise in Jerusalem. The Sun, Moon and Mercury are all in Leo with the Moon having just cleared the horizon. Regulus rose first followed by Mercury, the Sun and now the Moon. Comet Giacobini-Zinner is directly above and centred in the sky in Auriga like the noonday Sun. Maybe a good time to update my live cam links from Jerusalem?! This evening, the 10th of September 2018, after sunset I attempted to sight the moon. This was a difficult sighting and I was able determine the position of the moon with binoculars at around 7:26pm local time. However, seeing the moon with the naked eye was a big challenge, and I’m 100% sure I was able to see it. However, I cannot base any final conclusion based on what I saw. My oldest son was able to detect the moon with the binoculars, but not with the naked eye. The binoculars sighting is 100% correct, but the naked I can be challenged. I am convinced that under crystal clear sky the moon would have been much easier to see. Unfortunately this was not the case in my area. Due to the conditions, taking a photo was extremely difficult, and would have probably not given us anything. The only thing left to do from my position is to wait and hear from others. What a thing to "wake UP' to"!, this post!!!!!!!!!!!!!! !